Infra development has always been a priority for the government. In the 2017 budget, the government had increased the total allocation in the infrastructure sector by over 10 per cent. In the 2018-19 budget, we heard some positive news of connecting one lakh gram panchayats through high speed optical fibre network. This will enable broadband access to over 20 crore rural Indians in about 250,000 villages. 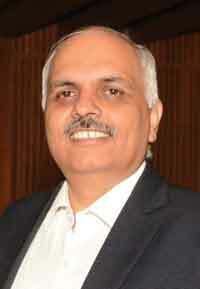 The Budget also provides `10,000-crore for creation and augmentation of Telecom infrastructure. ‘Sagarmala’, ‘Bharatmala’, ‘Jal Marg Vikas Project’ (JMVP), ‘Smart Cities Mission’, ‘AMRUT’, ‘Housing For All’, ‘Diamond Quadrilateral Network for High-Speed Railways’, ‘Dedicated Freight Corridors’ and ‘Indian River Inter-link’, etc., are some of the ambitious programs of the Government of India that will speed up the demand for construction equipment in the coming years. CASE India, a premium manufacturer of technologically-advanced products for the construction equipment industry, has a wide range of products considering the set of conditions prevailing in the country and other foreseeable factors at this moment. 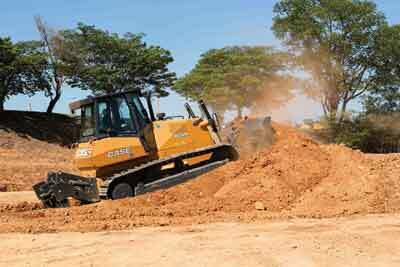 CASE India equipment are being used across the length and breadth of the country as well as abroad. Few prestigious projects where our machines are currently deployed are Sagarmala, Bharatamala and Trilateral Highway (India-Myanmar-Thailand highway). And, with the ever-increasing fleet of our superior products, the brand’s product line-up boasts a solution to meet almost every requirement of infrastructure development of the country. When we talk about road construction, Compactors, Graders and Dozers are the prime equipment used for different job-works. Under its compaction segment, CASE offers 752EX (9T Class) Vibratory Tandem Compactor, and 450DX Mini Tandem Compactor (3T Class). In soil compactors, CASE offers three variants of 1107EX in 11T class (Standard, Drum Drive, and Pad Foot Drum), which are perfect for uniform compaction across terrain. The powertrain of the compactor series provide outstanding performance, fast response time, and best-in-class fuel economy. To give you an overview here, CASE 752EX is equipped with a fuel-efficient 3.9-litre 4-cylinder engine, a mechanical injection system and internal exhaust gas recirculation delivering 76 HP at 2200 rpm and torque of 332 Nm at 1300 rpm. This new-generation engine is developed by CNH Industrial subsidiary FPT Industrial – the world-leading manufacturer of engines. The 752EX’s operator compartment features a rotating operator seat and tilt-able steering, which gives excellent front and rear drum/nozzle visibility, making the drive and compaction process easier and safer. The look of the machine is enhanced by a foldable canopy for ease of transportation, new fuel and water tanks and an all-new sophisticated instrument cluster. The CASE 450DX is another market leader in Mini Tandem Compactor segment in India. With 1,500-plus machine population, 450DX is perfect for shoulder compaction, service roads and basement compaction with compact design. CASE’s soil compactor variants are well-suited for various earth layers. They are technically equipped to provide information on amplitude, frequency and ICV (intelligence compaction value) – information related to density of soil compacted. Such information is available to the operator onscreen. The ICV value is different for difference surfaces. Once desired density is achieved, on-screen green light signals the operator to stop and avoid over compaction. In this way, saving of fuel and time is achieved, and damage to the surface is avoided. For high quality roads and highway construction, we have our CASE845B and CASE 865B Motor Graders imported from Brazil, which are used mainly for levelling and shaping a surface to very fine measurements. 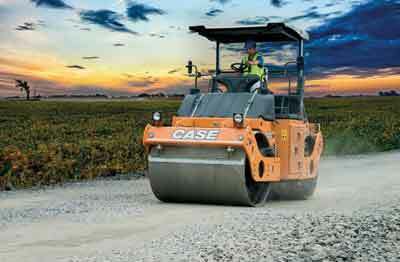 CASE Graders are the best available machinery in their class and are engineered to give a very long product life. Maximum productivity: CASE India’s Motor Grader comes with unique ‘Multi-radius moldboard design’ that provides mixing effect that does not only push the material on ground but also rolls it. CASE Graders are also equipped with hydraulic pitch control feature, which helps the operator to control moldboard pitch adjustment from cabin itself, hence high productivity as well as operator comfort. Advanced engine and hydraulics: To increase the machine’s durability, CASE India focuses on the use of quality engines along with regular maintenance across their equipment, which helps deliver excellent fuel efficiency. Consistency of controls and response of hydraulic operations, as the ability to make small and precise adjustments in the blade position, has a significant impact on profitability for the job. Optimize fuel efficiency: CASE India’s graders are equipped with FPT engine 6.7-liter engine with dual and triple horsepower to match the power requirements of various applications and deliver optimum fuel efficiency. CASE Graders have Power shift Transmission with torque converter and lock-up system and multi-curvature moldboard, which reduces the resistance coming on the engine and, hence, reduces the fuel consumption. Diagnosis and monitoring technology: Equipments are installed with a unique trip meter on the operator dashboard that continuously monitors the fuel consumption, hours operated and operating temperatures. Electronic indicators are also connected to the dashboard for safety-related or operation-related parameters. CASE has successfully sold over 300 units of Graders in India and we are expecting consistent growth in this segment this year as well. The company boasts of globally renowned CASE Crawler Dozers models – 1150L, 1650L, and 2050M – in the 13T, 18T and 20T class. The proven hydrostatic transmission through which a dozer is able to deliver maximum pull and push power during turning – unlike mechanical transmission – makes CASE Dozers stand out in the industry. The automated functions in the cab, which includes an electro hydraulic joystick to customize the reversing and steering sensitivity, makes the drivers’ job easier, allowing them to achieve shorter cycle times and boost their productivity. The cab can be tilted in 1150L and 1650L to provide full access to all main powertrain components. The operator can customise all the working parameters of the machine to achieve excellent controllability and faster cycle times. The 1150L and 1650L and 2050M models are available with XLT tracks to deliver excellent drawbar pull force and perfect dozer accuracy. Additionally, CASE Dozers features automatic blade functions to further increase operator’s efficiency and lubricated track, which is sealed and lubricated with an oil reservoir in each pin, providing outstanding durability. To summarise the above, CASE India has always maintained a leadership position in the Indian subcontinent, thanks to its market leading products, ever increasing loyal customer base and its transparent and ethical business conduct. Ammann India recently hosted a delegation of 34 members of the Builders Association of India (BAI), Gujarat Chapter. The visit was primarily to keep the association abreast with Ammann India’s new product launches, technology, processes being followed besides Ammann India’s focus on Skill development.